This content initiates a description of the social dimensions of the Puget Sound system with a short list of facts about population growth trends, how humans interact with and depend on the Puget Sound ecosystem for their wellbeing (in the broadest sense), and the large-scale policies and individual human activities that have the greatest potential impact on the Puget Sound ecosystem. The Puget Sound Partnership has the statutory goals of promoting “a healthy human population supported by a healthy Puget Sound that is not threatened by changes in the ecosystem” and “a quality of human life that is sustained by a functioning Puget Sound ecosystem.” This recognition of the interconnection between social and ecological systems is innovative yet difficult to quantify. While the Puget Sound Partnership adopted Vital Sign indicators specific to human wellbeing in 2015, data for the majority of those indicators are not yet available and are thus not presented here. 1. The Puget Sound coastal shoreline lies within 12 of Washington State’s 39 counties: Clallam, Island, Jefferson, King, Kitsap, Mason, Pierce, San Juan, Skagit, Snohomish, Thurston, and Whatcom. An additional two counties (Lewis County and Grays Harbor County) are also within the watershed basin, although they do not have Puget Sound coastal shorelines (based on a GIS overlay of NOAA’s ERMA watershed layer and the 2013 U.S. census county boundaries). 2. As of 2014, the 12 Puget Sound coastal shoreline counties accounted for 68% of the Washington State population, 4,779,172 out of 7,061,530. Over 2 million of these residents live in King County, the largest county in the Puget Sound and Washington State (US Bureau of the Census, 2015). 3. There are 19 federally recognized tribes and nations within the Puget Sound Region, including the Jamestown S’Klallam, Lower Elwha Klallam, Lummi, Makah, Muckleshoot, Nisqually, Nooksack, Port Gamble S’Klallam, Puyallup, Samish, SaukSuiattle, Snoqualmie, Stillaguamish, Squaxin Island, Swinomish, Suquamish, the Tulalip Tribes, and the Upper Skagit Indian tribes (US Bureau of Indian Affairs, 2015). All but two of these (the Samish Nation and Snoqualmie Tribe) are treaty tribes. a. There are several additional tribal communities without federal recognition. One of the more prominent examples is the Duwamish tribe, the tribe of Chief Seattle who is the namesake of the Puget Sound’s largest city. After 38 years of seeking federal status, the Duwamish tribe’s petition for federal recognition received a final denial in 2015 (U.S. Department of the Interior, 2015). 4. The population density of Puget Sound varies significantly, from 16.6 people per square mile in Jefferson County to 913 people per square mile in King County (US Bureau of the Census, 2015). 5. From 2010 to 2014, population growth in Puget Sound coastal counties was estimated to increase by 5.8%, while the population of WA State was estimated to increase by 5.0% (US Bureau of Census, 2015) and the projected growth of all U.S. coastal shoreline counties was 4.1% (NOAA, 2013). King County’s growth rate (7.7%) was 18% higher than the second fastest growing Puget Sound county, Snohomish (6.5%), and 43% higher than the third fastest, Thurston (5.4%) (US Bureau of the Census, 2015). Between 1990- 2010, the majority of growth in King County was due to immigration from Asia, Latin America, Eastern Europe, and Africa (King County, 2012). 6. Puget Sound population is estimated to reach over 5.7 million by 2030, an increase of 18.2% from 2014 population estimates (Washington State Office of Financial Management, 2012b). During this same time frame, population projections for the United States are 12.7% (US Bureau of the Census, 2015). 7. In King County, the median household income in 2011 was $70,000/year, with the highest incomes on the Eastside of Lake Washington (median $90,000/year). Between 1999 and 2007, the greatest changes in income distribution were in those households below the 50% poverty threshold ($33,625 in 2007 dollars) (a 25% increase in households) and households over the 180% poverty threshold ($121,000 in 2007 dollars) (a 17% increase in households) (King County, 2013). 8. 84% of Puget Sound residents say they frequently feel inspiration, awe or reduced stress as a result of being in the Puget Sound natural environment (Puget Sound Partnership, 2015). 9. About 51% of Puget Sound residents like to gather or hunt local wild foods, although 70% do so only occasionally or rarely. 71% of those who harvest are able to collect as much as they would like, with the primary barrier being personal time availability (65%) and access to the natural resources (54%) (Puget Sound Partnership, 2015). 10. 76% of Puget Sound residents say they are able to maintain cultural practices associated with the environment (Puget Sound Partnership, 2015). 11. Between 1990 and 2010, over 30.4 million pounds of fish and shellfish were kept for personal use by commercial fishing vessels whose homeports were located within the Puget Sound (Poe et al., 2014). The majority of this use (85%) was for tribal fisherman. Except for steelhead, the market value of fish had no effect on the amount kept for subsistence. 12. In 2014, total economic contribution of outdoor recreation to the 12 Puget Sound coastal counties totaled just over $10.1 billion and supported about 118,00 jobs (Earth Economics, 2015). 13. The 2011-2012 reported recreational salmon catch for Puget Sound was 229,654 salmon from a total of 424,114 marine angler trips. Over 50% of these were pink salmon, 25% were coho and about 12% were Chinook (Washington Department of Fish and Wildlife, 2014). This is about 43% less than the number reported in 1976.
a. Since 1999, the number of recreational fishing license sales has oscillated between about 150,000 and 225,000 per year. The variation in sales is driven mostly by pink salmon runs. 14. 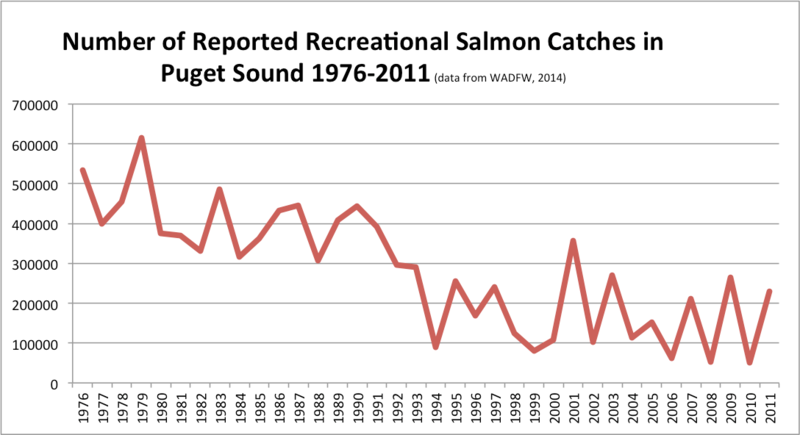 The 2011-2012 steelhead sport catch equaled 6,846 fish from the Puget Sound region (Washington Department of Fish and Wildlife, 2014). 15. 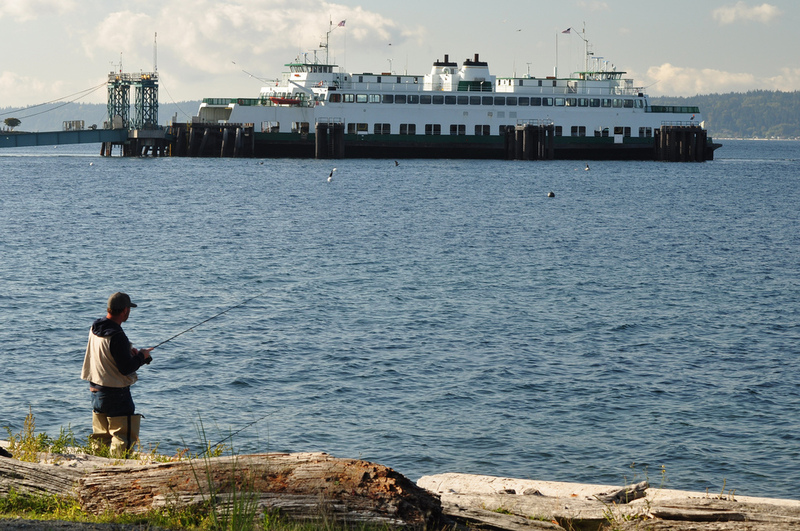 There are 58 public fishing piers in the Puget Sound. Hundreds of other public boat and shoreline access sites are maintained by Washington Department of Fish and Wildlife, city and county parks, and other local land managers (Washington Department of Fish and Wildlife, 2015). 16. In 2011, nearly 145,000 boating vessels were registered in the counties that border Puget Sound with about 33,000 of those requiring sewage pumpout facilities or dump stations according to federal guidelines (Herrera, 2012). a. As of 2012, there were 115 publicly accessible pumpout stations in the Puget Sound (Herrera, 2012). 17. Ports: Imports and exports at the ports of Seattle and Tacoma totaled a combined $77 billion in 2013. Taken together, the two seaports were the equivalent of the 4th largest U.S. seaport by export value in 2013 (Northwest Seaport Alliance, 2014). 18. Aerospace: Puget Sound’s aerospace industry remains an economic leader, with Boeing contributing about 70 billion dollars to the state economy each year (Washington Aerospace Partnership, 2013). 19. Information technology: Seattle’s information technology industry includes giants like Microsoft and Amazon, and according to the Washington Technology Industry Association, the state’s tech companies bring in a combined $37 billion in annual revenues (Washington Technology Industry Association, 2015). Information technology provides 144,000 jobs in the Puget Sound region (Puget Sound Regional Council, 2015). 20. Fishing and seafood processing account for nearly half of all maritime-related employment in Puget Sound (Puget Sound Regional Council, 2015). 21. Washington State is the leading producer of farmed bivalve shellfish in the United States, generating an estimated $77 million in sales and accounting for 86% of the West Coast’s production in the year 2000 (Northern Economics, 2010). Within Puget Sound, farmed shellfish (clams, mussel, geoduck, oyster, and scallops) harvests have ranged from 3.8 million pounds in 1970 to 11.4 million pounds in 2008. 22. Overall, shellfish in Puget Sound have a commercial value of almost $100 million a year. The non-native Pacific oyster accounts for close to $60 million of this value, with the remainder coming from native crabs, clams, and mussels. (Dethier, 2006). 23. As of May 2015, the Department of Health (DOH) classified just over 190,000 acres as shellfish growing areas within 92 different growing areas in the Puget Sound (PSP, 2015). To ensure the health of those consuming shellfish harvested in these areas, the DOH additionally classifies these growing areas on a basis of approved, conditionally approved, restricted, and prohibited. As of May 2015, over 36,000 of the 190,000 acres were prohibited (PSP, 2015). 24. Unlike many coastal states that maintain public ownership of shorelines, between 60- 70% of Washington’s tidelands and beaches are privately owned (Osterberg, 2012). 25. In 1854-1855, five treaties (Treaty of Medicine Creek, Treaty of Neah Bay, Treaty of Olympia, Treaty of Point Elliott, Treaty of Point No Point) were signed that provided tribally reserved rights to “taking fish at usual and accustomed grounds and stations” and “hunting and gathering roots and berries on open and unclaimed lands” (Treaty of Point Elliott, 1855). These rights received little attention, however, until the 1974 Boldt Decision defined tribal fishing rights to half the harvestable number of salmon passing through tribes’ usual and accustomed fishing places, including salmon produced in hatcheries. Additionally, the Boldt Decision established tribes as co-mangers of the state’s salmon, restricted the state’s ability to regulate tribal fishing, and established the duty of state and federal governments to protect salmon habitat (Northwest Indian Fisheries Commission, 2015). a. The Rafeedie Decision in 1994 extended this clarification of treaty rights to include half of all shellfish from usual and accustomed places, except for those “staked or cultivated” by citizens (Northwest Indian Fisheries Commission, 2015). 26. Since 1990, the State of Washington’s Growth Management Act (36.70a RCW) has required state and local governments in counties with a population of 50,000 or more and population growth between 10-20% for the years 1985-1995 to manage growth by identifying and protecting critical areas and natural resource lands, designating urban growth areas, preparing comprehensive plans, and implementing them through capital investments and regulations (Washington State, 1990). While the state establishes goals and deadlines for compliance, local governments choose the specific content and implementation strategies of their comprehensive plans. This has resulted in significant collaboration among counties and cities to protect natural areas in fast-growing areas (Puget Sound Regional Council, 2009). a. Between 1986 and 2007, urban land cover increased from 8% to 19% in six Central Puget Sound counties (King, Pierce, Snohomish, Kitsap, Thurston, Island), with the largest and fastest increases happening outside urban growth boundaries (Hepinstall-Cymerman et al., 2013). During that same time, lowland forest coverage decreased from 21% to 13% and grass and agriculture decreased from 11% to 8%. 27. Washington’s Shoreline Management Act requires all cities and counties to prepare and adopt a Shoreline Master Program (SMP) that designates shoreline use, environmental protection, and public access to all marine waters, streams and rivers with greater than 20 cubic feet per second mean annual flow, lakes 20 acres or larger, shorelands that extend 200 feet landward, wetlands, and floodplains. These programs must be approved by Washington State Department of Ecology. As of August 2015, 33 of Puget Sound’s cities had completed SMPs. Six of Puget Sound’s coastal counties had completed SMPs, three had SMPs under review, and three were still under development (Washington State Department of Ecology, 2015). 28. About 15% of Puget Sound falls within a marine protected area (Osterberg, 2012). There are 110 officially designated marine protected areas in Puget Sound, encompassing 366,503 acres and about 600 miles of shoreline (Van Cleve, 2009). These protected areas have been established and or managed by 10 different local, county, state and federal agencies and are classified into 12 different types, varying in allowed levels of access and harvest (Osterberg, 2012). 29. The Washington State Salmon Recovery Act, passed in 1998, required communities to write local salmon recovery plans to address Endangered Species Act listings. Two of the six plans that have been approved by the federal government are in the Puget Sound region (Puget Sound and Hood Canal). The development and implementation of plans has been led by collaborating tribes, government agencies and other recovery organizations (Washington State Recreation and Conservation Office, 2014). a. In 2014, $24.8 million state dollars were dedicated to salmon recovery efforts from the Salmon Recovery Funding Board and the Puget Sound Partnership (Washington State Recreation and Conservation Office, 2014). b. The federal Comprehensive Environmental Response, Compensation and Liability Act (CERCLA, or Superfund) and the state Model Toxics Control Act, which are management by the U.S. Environmental Protection Agency and the Washington State Department of Ecology, respectively. Both regulate the cleanup of toxic sites. c. The federal Clean Water Act which requires, among other things, long-term Combined Sewage Overflow planning. d. The federal Endangered Species Act and resulting recovery plans for listed species, including the Northern spotted owl, Puget Sound Chinook salmon, Hood Canal summer chum salmon, Puget Sound steelhead, Southern Resident Killer Whales. 31. 34% of Puget Sound residents trust local policymakers to make good decisions about Puget Sound restoration (Puget Sound Partnership, 2015b). 32. 91% of Puget Sound residents are proud to be from the Puget Sound region, and 81% feel a connection to the region (Puget Sound Partnership, 2015b). 33. 86% of Puget Sound residents agree that restoration of the Puget Sound is a good use of tax dollars (Puget Sound Partnership, 2015b). 34. 80% of Puget Sound residents agree that they feel a sense of stewardship for Puget Sound natural resources (Puget Sound Partnership, 2015b). 35. From 2010-2013, the number of housing units in Puget Sound increased 1.6% (from 1.96million houses to 1.99million). As of 2013, there were 23,689 active building permits in the Puget Sound region (US Bureau of the Census, 2015). 36. Between 1999 and 2014, travel in a single occupancy vehicle decreased by 6% in the Puget Sound region (from 48% of trips to 42% of trips). Travel trends have shifted to walking (about 6% increase in the same time period) and transit (about 1.5% increase) (Puget Sound Regional Council, 2015). 37. Waste Management, the largest company in the Puget Sound region that collects and disposes of household waste (parts or all of Snohomish, Island, King, Kitsap, Mason, and Skagit counties), reported a 1% decrease in 2013 revenues and 1.4% decrease in 2014 because of a decline in the total volume of waste generated. The company attributes the decline to economic conditions, pricing changes, competition, and diversion of waste by consumers (Waste Management, 2014). 38. Puget Sound Energy, serving over 1 million customers in the Puget Sound region, generates approximately 50% of its energy from renewable resources (Puget Sound Energy, 2015a). Seattle City Light, serving over 400,000 Puget Sound customers, generates over 94% of its energy from renewable sources (Seattle City Light, 2013). a. In 2013, Puget Sound Energy sold 22.9 million megawatt hours to its over 1 million customers. (Puget Sound Energy, 2015b). b. From December 2011 to 2013, the number of customers participating in Puget Sound Energy’s Green Power Program increased by 26%, from 32,459 to 41,000 customers. Correspondingly the kWh of renewable power that were purchased in this same time period increased by 10.8 %, from 343 million kWh to 380 million kWh of green power (Puget Sound Energy, 2015b; Puget Sound Energy, 2012). c. The average annual residential consumption for Seattle City Light has remained stable since 2009 (almost 9,000 kWh) while the rate as consistently increased from a little over 6cents/kWh in 2009 to over 8cents/kWh in 2013 (Seattle City Light, 2013). 39. Between 2013 to 2015, the Puget Sound population that usually or always engaged in behaviors that are helpful to the Puget Sound decreased from 56% to 54%. The most commonly practiced were picking up dog waste and checking one’s vehicle for fluid leaks; the least commonly practiced were using pumpout stations, planting native plants along private property waterways, and getting annual septic inspections. During the same time period, the percentage of the population that seldom or never engaged in individual behaviors that are known to harm the Puget Sound increased from 75% to 79%. The most avoided behaviors include disposing of chemicals, prescription drugs or cooking oil down the drain. The least avoided behaviors were fertilizing one’s lawn and washing one’s car in the driveway, street, or parking lot (Puget Sound Partnership, 2015a). a. The 2015 Sound Behavior Index improved from 2013, with a score of .84 compared to .747.
b. The primary correlations to a high SBI score in 2015 were renting a home and having an income less than $50,000 per year. The primary correlations to a low SBI score in 2015 were being 18-24, income over $50,000, conservative political orientation, number of years lived in their county, and reported ethnicity of American Indian/Alaska Native. Dethier, Megan N., (2006). Native Shellfish in Nearshore Ecosystsms of Puget Sound. Retrieved from: http://www.pugetsoundnearshore.org/technical_papers/shellfish.pdf. Earth Economics. (2015). Economic Analysis of Outdoor Recreation in Washington State. Report prepared for WA Recreation and Conservation Office. Appendix F. www.rco.wa.gov/documents/ORTF/EconomicAnalysisOutdoorRec.pdf. Hepinstall-Cymerman, J., S. Coe and L. Hutyra. (2013). Urban growth patterns and growth management boundaries in the Central Puget Sound, Washington, 1986-2007. Urban Ecosyst 16:109-119. Herrera. (2012). Puget Sound No Discharge Zone for Vessel Sewage: Puget Sound Vessel Population and Pumpout Facilities. Prepared for WA State Department of Ecology. Publication No 12-10-031 Part 3. King County. 2013. King County’s Changing Demographics: A view of our increasing diversity. http://www.kingcounty.gov/exec/PSB/Demographics/DataReports.aspx. (with data from U.S. Census). NOAA. 2013. State of the Coast. Retrieved May 2015 from http://stateofthecoast.noaa.gov. Northern Economics (2010, April). Assessment of Benefits and Costs Associated with Shellfish Production and Restoration in Puget Sound. Retrieved from http://www.pacshell.org/pdf/AssessmentBenefitsCosts.pdf. Northwest Indian Fisheries Commission. 2015. Understanding Tribal Treaty Rights in Western Washington. http://nwifc.org/member-tribes/treaties/. Northwest Seaport Alliance. (2014). The Economic Impacts of Marine Cargo at the Ports of Tacoma & Seattle. Fact sheet. Retrieved on October 1st, 2015 from https://www.nwseaportalliance.com/stats-stories/economic-impact. Osterberg, A. 2012. Developing a Network of Marine Protected Ares in Puget Sound: A synthesis report on challenges, opportunities and policy options. Retrieved from http://www.psp.wa.gov/downloads/MPA/MPANetwork_FINAL_0928%20copy.pdf. Poe, M.R., Levin, P.S., Tolimieri, N., Norman, K. (2015, April 24). Subsistence fishing in a 21st century capitalist society: From commodity to gift. Ecological Economics, 116 (2015) 241-250. Retrieved from http://www.sciencedirect.com/science/article/pii/S0921800915002189. Port of Seattle. (2015). Port of Seattle website. Retrieved September 2015 from: https://www.portseattle.org/Pages/default.aspx. Puget Sound Energy. 2012. Thinking Green is Re-Energizing. Green Power Report. http://pse.com/savingsandenergycenter/GreenPower/Reports/Documents/GPR_W... r12.pdf. Puget Sound Energy. (2015a). Electric Supply. https://pse.com/aboutpse/EnergySupply/Pages/Electric-Supply.aspx. Puget Sound Partnership (2015a). Sound Behavior Index-2015 Survey Report. Puget Sound Partnership (2015b). General Public Opinion Survey 2015. Starcrest. (2007) Puget Sound Maritime Air Forum Maritime Air Emissions Inventory. Prepared by Starcrest Consulting Group LLC for the Puget Sound Maritime Air Forum. April 2007. U.S. Department of the Interior. 2015. Official letter accessed online, July 2015. https://turtletalk.files.wordpress.com/2015/07/idc1-030828.pdf. U.S. Energy and Information Agency (2014). Washington State Profile and Energy Estimates: Profile Analysis. Retrieved from: http://www.eia.gov/state/analysis.cfm?sid=WA. Van Cleve, FB, G Bargmann, M Culver, and the MPA Work Group. 2009. Marine Protected Areas in Washington: Recommendations of the Marine Protected Areas Work Group to the Washington State Legislature. Washington Department of Fish and Wildlife, Olympia, WA. Washington Aerospace Partnership. (2013). Retrieved September 25, 2015 from http://www.psrc.org/assets/10090/CAI_WAP_Impact_Estimates_2013_10-2- 13_FINAL.pdf. Washington State Department of Ecology. 2015. Introduction to the Shoreline Management Act. http://www.ecy.wa.gov/programs/sea/sma/st_guide/intro.html Washington Department of Fish and Wildlife (2014).